I am delighted to be handing the blog over to author Patricia Gibney today as she shines the spotlight on her character, Lottie Parker. Lottie Parker is a Detective Inspector in the town of Ragmullin. Ragmullin is situated in the heart of the Irish midlands, a town surrounded by lakes, architecture and deep, dark secrets. When we meet Lottie in book one, The Missing Ones, her husband Adam is just over three years dead. She has three teenage children. Katie is nineteen, a bit of a tearaway. Chloe is sixteen, the sensible one, struggling to keep things in order, including her mother. Sean is thirteen and a half. He immerses himself in the world of his PlayStation. All three children have their own ways of coping with the loss of their dad and their grief. But Lottie isn’t coping too well. She’s been through a spell of drowning herself in alcohol. When we first meet her she has battled her way through that demon and tries to avoid alcohol but is too dependent on her ‘happy pills’. Lottie features in all four books. 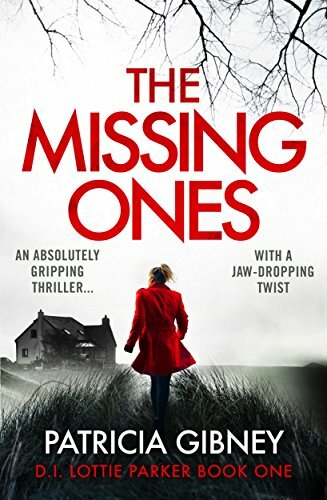 The first – The Missing Ones – published on Amazon by BookOuture on March 16th 2017. The second – The Unwanted – will publish in the summer. Hopefully the third will be out by the end of the year and the fourth in 2018. Why did I create her? I started writing The Missing Ones in January 2011. I’d lost my husband, aged 49, after a very short battle with cancer, in 2009. I was struggling, drowning – all the clichés – I suffered through them. I couldn’t work. I had to give up my job. I didn’t know how to live with my grief. On 1st January 2011, I started to write, it was sort of therapy, my way of getting out of my own head and into someone else’s. It was such a relief. I created Lottie Parker. To me she was a real life person. She followed me around. Walked in my shadow. Whispered in my ear. I couldn’t shake her off. I liked her. So I created a family for her to nurture and a town for her to live in. I made her a DI in the local police. I really knew nothing about policing but all my life I’ve been an avid reader of crime thrillers, so it was obvious to me that was where Lottie was going to work. I’ve since got plenty of advice from detective friends, most of which I ignored in order to help the story flow. It is fiction after all! Did I write the book to accommodate her? I basically started with one character and a location. I built the plot up around that. From the outset I knew there was more than one book in Lottie Parker. I like Lottie’s ability to stay focussed on her job while her world is crashing around her ears. I love her interaction with DS Boyd. They have had a one-night stand, unconsummated due to the fact she was inebriated, and there is a subtle tension between them. In her own madcap way Lottie loves Boyd. But she frustrates the hell out of him. The thing I least like about Lottie is her inability to recognise that she hasn’t grieved properly for Adam. She needs help but won’t seek it. She’s stubborn. I first read out excerpts from The Missing Ones at a writing course in The Irish Writers Centre while the book was still a work-in-progress. I was astounded at the reaction to Lottie. Everyone loved her. I had thought, this is just a piece of my imagination, but then people were talking about Lottie like she was a real-life person. I had believed her to be real to me, but it was the first time I recognised that she could be real to others also. I gave the completed manuscript to a couple of friends to read and they all wanted to know what Lottie would do next. I know they’re my friends, but they are my best critics! Hopefully my readers will react favourably to her. I couldn’t believe it, when the first agent I sent the book to, Ger Nichol of The Book Bureau, emailed me when she was half way through the manuscript to say she loved Lottie and loved the book. At that stage I had Lottie set up for book two. Just as well. I signed with Ger in January 2016 and by May, Bookouture were interested. I signed a four-book deal (e-publishing) in July 2016 with Bookouture, London. Lottie is a figment of my imagination, but of course real life experiences influence her character. But she is not me and I’m not her. I could never get up to what she gets up to! My children were once teenagers, so I knew the kind of mayhem to throw at Lottie. I could get inside her head like she had got inside mine. Would she be my friend? I would like to think Lottie and I could be friends. She is loyal and trustworthy, but she won’t suffer fools. I’m a very disorganised writer. I can’t plot and plan. Not at the start, anyway. I need to be about 30,000 words into the novel before I start planning properly. I begin with the thread of an idea. I write on the Scrivener application so it’s great to create scenes that are not necessarily in the correct order. I write about things and places and characters that pop into my head, with Lottie the central lynchpin. I have book two submitted to my editor and have started book three. Where Lottie will end up by book four is anyone’s guess because at the moment I’m just dragging her through a minefield (not literally) at the beginning of book three.